Jackson Kamara, 72, was almost blind when he came to us. We took Jackson to the Baptist Eye hospital in Lunsar, Sierra Leone, where he had cataract surgery in his right eye on March 1 and to his left eye on March 4. I went to visit him on March 5. 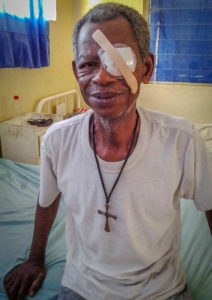 He had regained vision in his right eye and he told us: “I am very, very happy.” As soon as his left eye patch is removed, he will see clearly from both eyes.